In my previous ALTHEA haul, I also got myself the Skinfood Rice Mask Wash Off. My sister thinks that the mask can help brighten her skin, and since I got some extra credits, I thought that it will be a nice addition that we all can share. This mask is one of Skinfood popular masks, along with the Black Sugar mask and the Hot Sesame. I must say that I’m not into scrub type mask, and that’s why I had never considered to buy the Black Sugar or the Rice Mask since I am afraid that physical exfoliation will damage my skin. 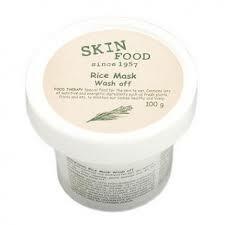 But the Skinfood Rice Mask texture is actually soft enough to give you a very gentle exfoliation. Skinfood claims that this mask will transform skin into a pure and soft texture. Ingredients that stand out the most is the rice bran water and jojoba oil. It is package in a 100g tub with double lid. I do wish that they provide a spatula to go with the mask just to aid the application and make it more hygienic. It has a nice soft floral scent to it, and the mask contain this soft jelly like grains that mimics rice. The mask itself has this creamy lotion feel to it. The instruction is to use after cleansing by massaging the mask over dry face around 10-15 minutes. I usually leave it for 10 minutes and massage for 2-3 minutes in circle motion. I use this mask 1-2 times a week and had not faced any irritation or breakouts. Upon washing, the skin will feel softer, moisturized, brighter and clean. I tried to capture the difference in the photo but it is not translating very well. On the low side, apart from not being hygienic (no spatula), this mask also contains parabens, therefore for those who are steering clear from parabens, this mask is not for you. I still feel that chemical exfoliation with Vitamin C, AHA and BHA is milder in the skin (with the right concentration) but it’s a good physical exfoliates to try once in a while to just boost the skin condition. Wow..great product!!! I would like to try it out!! Wow I love it exfoliate our skin =D I never try use skinfood before! Looks like a great product! !